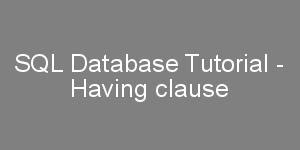 So your 1st and foremost answer is that you use having clause with "group by" clause. How and why we will come to later part in of this discussion. Having said that before we proceed make sure you know what group by clause does. Also you need to have an idea of what aggregate functions are . Eg. min(), max(), count(), sum() etc. So far we know we use having clause with group by clause. Let's answer the question why. Let's say you have a table employee which have basic data of an employee - id, name, department etc. This works fine. Now let's redefine our problem statement. 00934. 00000 - "group function is not allowed here"
Once result is obtained then group by clause is applied to it to get the next set of result. Once that is done condition is having clause is applied to further filter the result. Finally order by clause is applied to sort the result as required and return. NOTE : where clause us applied to filter results before group by clause is applied where as having clause is applied after.